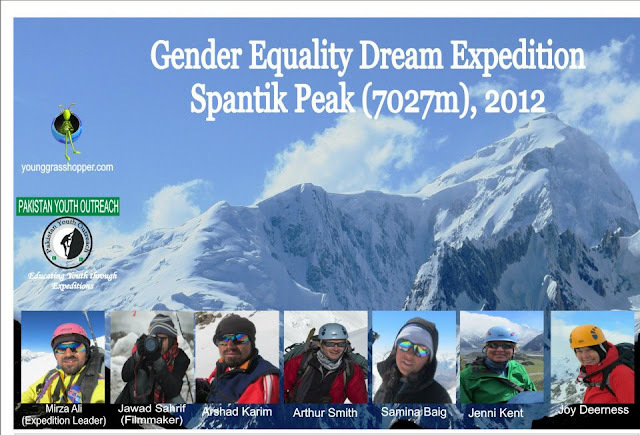 http://www.pakyouthreach.com , http://www.karakorumexpedition.com, Continuing the quest to promote outdoor sports after three successful mountain climbing expeditions and a small school in Arandu valley in Baltistan, it is our great pleasure to launch another historical, myth, and barrier breaking mountain climbing expedition for Gender Equality to a 7027 m Peak. The expedition has been named “Gender Equality Dream Expedition Spantik Peak (7027m),2012. Samina Baig, the only rising female mountaineer of Pakistan is the center character of the expedition along other foreign friends! The expedition is aimed to promote outdoor education, awareness in Pakistan, promote women adventure and empower women through adventure! 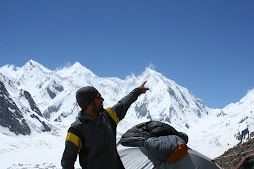 This expedition is a myth breaking Adventure in Pakistan mountain climbing history and a gate way for Pakistani woman to embark on high altitude mountain climbing. Samina baig is a 21 year old from a remote village Shimshal, is only Pakistani mountain climber girl to adopt mountaineering as a profession. Her goal is to empower women through adventure and encourage them to explore the mountains. Samina Baig and her Brother Mirza Ali started Pakistan Youth outreach Program, an initiative to educate and give awareness about outdoor activities and research work on glaciers, mountains and promote as well as encourage women in mountain adventure sports in Pakistan. In the last two years PYO organized three mountain climbing expedition to two 6000m plus virgin peaks and first Pakistan women winter expedition. Samina first ascent of Chashkin sar “Samina Peak” documentary for Geo tv was first mountain climbing documentary in Pakistan Adventure history, following 2011 gender equality expedition to “Koh-i-brober “ promotional AD for gender equity was another landmark of PYO for promoting ,empowering women as well as youth about adventure sports. Pakistan is home of mountains, worlds five 8000 meters peaks are in Pakistan, there are nearly 7000 mountains above 6000meters, above 5000meters they are countless, beside mountains out of polar range there are more than six glaciers ranges that stretches plus 50km including Siachen glacier. There are hundreds of challenging passes ,lush green valleys, awe inspiring lakes ,yet having all the great potential in the country, until now no female Pakistani female mountain climber has been produced who could have climbed over 7000m there is NO Pakistani female who stepped on the top of any 8000 meter in the world. It is surprising that Iranians,Indians,Arab and even Bangladeshi women have summitted mountain Everest , some of these countries even no mountain exist higher than 3000m,yet those girls brought pride to their countries. Our Gender Equality Dream Expedition, aim is to prepare and produce Pakistani female mountaineer, who could be role model for other girls to come in to mountain sports, promote tourism and encourage domestic mountain related sports. A short film of the expedition will be made for film festivals in foreign countries, international adventure TV channels, such as National Geographic and discovery. The short film may also be aired on leading tv channels in Pakistan those would be interested in airing it. The expedition seeks to educate youth about mountain sports and to bring awareness and promotion of women’s adventure and to give other women encouragement to conquer the Karakorum.